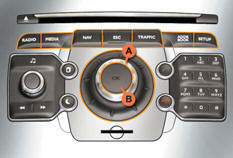 - display screen or navigation system parameter settings menus. For more information on these applications, refer to the Peugeot Connect Media Navigation (NG4 3D) section. For operation of the retractable screen (opening, closing, adjustment of the position, etc. 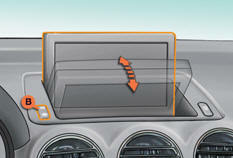 ), refer to the "Access to the retractable screen" section. Press the "SETUP" button to gain access to the "SETUP" menu. - select the language used by the display (Deutsch, English, Espanol, Français, Italiano, Nederlands, Polski, Portugues, Portugues-Brasil, Türkçe * ), - select the voice recognition parameters (activation/deactivation, advice on use, personal voice programming, etc. ), - set the volume of the voice synthesiser. This menu allows you to set the date and time, the format of the date and the format of the time. 1. confirm the selection "Synchronise with GPS", the time is then aligned with GMT universal time, the date is updated as well. 2. Using the 4-direction navigator, move the cursor onto the hours fi eld and press on OK .
3. Using the rotating ring, you can then adjust the time to the time zone of your choice. Note that in the case of a summer/ winter time change, the time zone must be set again manually. 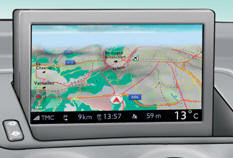 This menu allows you to select the units: temperature (°C or °F) and distance (miles or km). This menu allows you to restore the factory configuration, display the software version and activate scrolling text. This screen is opened and stored automatically. - angle adjustments by means of control B . 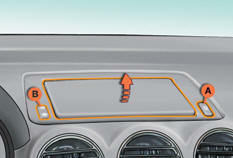 It is also fitted with safety auto-reverse protection. With the screen stored, press control A to open it. The screen opens automatically when the ignition is switched on, when the audio and telematics system is switched on, when an outgoing telephone call is made, when a voice command is given and when a warning message linked with the STOP warning lamp is received. If you close the screen during operation of the audio and telematics system, it will re-open automatically when an outgoing telephone call is made, when a voice command is given or when a warning message linked with the STOP warning lamp is received. With the screen open, press control A to store it. The screen is stored automatically when the ignition is switched off, after approximately three seconds, if the audio and telematics system is off. If the screen meets an obstacle as it opens or closes, the movement stops immediately and is reversed by a few millimetres. After clearing the obstacle, issue the command required again. If you wish the screen to open or close automatically when the audio and telematics system is switched on or off, the screen must not be closed when the audio and telematics system is operating. push or pull the screen gently by hand. The system has four pre-set positions in its memory. Each time the screen is closed, the system stores the last position of the screen. Each time the screen is re-opened, the system returns the screen to the pre-set position closest to that stored.